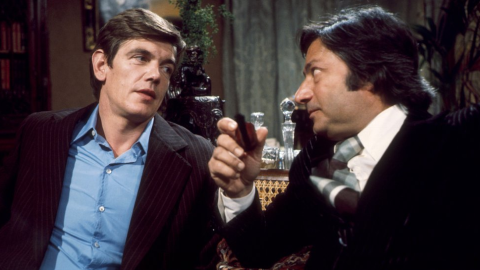 Saeed Jaffrey, the well known Indian actor died today (Nov 16th 2015), aged 86. He will probably be best remembered for appearing in Gandhi, amongst a hugely long and impressive list of different film and television roles, but he also appeared in the Play for Today, and subsequent series, Gangsters (1975, 1976 & 1978), at BBC Pebble Mill. Gangsters was apparently one of his first roles after he moved from India to the UK. He played Aslam Rafiq, the charismatic boss of an illegal human trafficking racket. Gangsters was produced by David Rose; Philip Saville directed the Play for Today, and Philip Martin devised and wrote the film noir, which was inspired by The French Connection.